Image caption Marina Gambold was 16 when she was taken to the laundry. Two survivors of Ireland's Magdalene laundries have spoken of their experiences. Marina Gambold was taken to a laundry aged 16 by a priest. She remembers being forced to eat off the floor. Maureen Sullivan, now 60, was sent to a Magdalene laundry in New Ross, County Wexford, at the age of 12. Marina Gambold was orphaned when she was eight years old after both her parents died. She lived with her grandmother for a couple of years but when she was 16 she found she had nowhere to go. The priest then took her to the Magdalene laundry. "I walked up the steps that day and the nun came out and said your name is changed, you are Fidelma, I went in and I was told I had to keep my silence," she said. "We had to scrub corridors, I used to cry with sore knees, housemaids' knees, I used to work all day in the laundry, doing the white coats and the pleating. Ms Gambold also spoke of what happened on a day when she broke a cup. Most of the time I have cried bitter tears, especially when I had nobody, pain never goes away. "One day I broke a cup and the nun said, 'I will teach you to be careful'. "She got a thick string and she tied it round my neck for three days and three nights and I had to eat off the floor every morning. Ms Gambold also spoke of a time when a nun locked her out in the cold overnight. "Another thing I will never forget is the evening I ran out on the balcony which was all glass on a winter's night," she said. "She locked me out there for two nights me and two other girls and I nearly died of the cold." Ms Gambold was in the laundries for about three years. She left when she was 19 and left Ireland. "When I came out of the convent I was determined to get out of Ireland. "I was 19 years of age then and had a nervous breakdown. I lived in England for almost 30 years before I moved back with my husband. "Most of the time I have cried bitter tears, especially when I had nobody, pain never goes away." 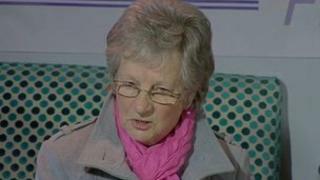 Maureen Sullivan's mother remarried after her father died and Maureen claims she was abused by her stepfather. Image caption Maureen Sullivan was sent to the Magdalene laundry in County Wexford when she was 12. The nuns noticed, called in a priest and convinced her mother that Maureen would be going to a "lovely school". She said she never saw her school books again, was forced to work night and day, seven days a week, and was given a new name, Frances. "What an evil thing to do. I never did any wrong. I was an innocent child and a nun told me I could trust her to tell her my story. I trusted her and what a fool I was. I mean when you look back now," she said. "You were brought up then to think you could trust a nun or a priest but they did a lot of wrong by me and very many other people." Ms Sullivan said her day began at six in the morning, and finished at nine at night. She would have to scrub and polish floors, work in the laundry and then make rosary beads and knit Aran sweaters. "Everything was taken from me; my name, my rights as a child to go out and play with other children, my rights to communicate with other people," she adds. Maureen Sullivan spent two years in New Ross, then further periods in a laundry in Athy, County Kildare, and another in Dublin. She said she had virtually no contact with her mother - just four visits in five years. "I was coming up on 16 and my mother came up and said 'Maureen, do you not think it's time you should be getting paid now', so, I said it to the reverend mother and the next morning my case was packed and I was left at Heuston station with £5 in my hand," she said. "Back to the town that I was abused in. And nobody cared about me or what happened to me." Maureen Sullivan said she left the laundries unable to communicate properly, with low self-esteem and virtually no education. Widowed twice, she said she found it hard to trust people.